Eat your way to happiness in San Diego. Sharing great meals is a big part of our family’s culture. Eating out is an adventure. And so is cooking together. Children hum when a good meal is served. And when the whole table is humming? Oh, it makes this mama proud. My kids plan the next meal while they’re eating the current one. In a word, we are: foodies. Good eating on vacation is an absolute necessity for us. It isn’t really a vacation for us unless the food is tasty — and reasonably affordable. Make your staycation a tasty one. San Diego, our home for the last four years, is a great spot to live. We are so thankful for all the interesting adventures just waiting to be had here. It’s the perfect place for a staycation — or vacation, if you don’t happen to live here already. A Culinary Staycation is a term that may or may not already be in existence. I may have just made it up. I was looking for the right words to describe my favorite kind of vacation. The one where you eat well and don’t have to do any dishes. Keep in mind that I’m a mother of six young children, living on a budget. Our family loves to eat out, but we’re also focused on getting our biggest bang for the buck — while trying to include as many real foods as possible. That means I do not include five star restaurants in this round-up. Think of this as an eating tour of San Diego — for normal people. And whether you’re a local or an out-of-town visitor, it’s good to have a collection of good cheap eats to draw from. 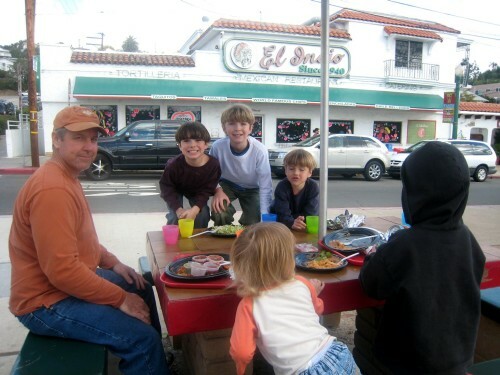 The following are some of our family’s top picks for good eats throughout San Diego County. Many of them are independent establishments, though there are some chains thrown in for good measure. 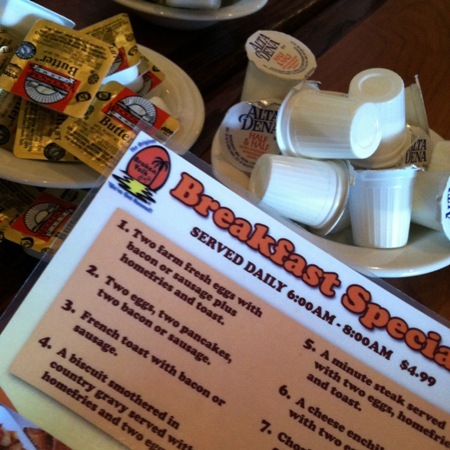 The Broken Yolk Cafe is our family’s choice for good, filling breakfasts out. The portions are so large, you could easily skip lunch and have an early dinner in order to economize. There are locations in Pacific Beach, La Costa, the Gaslamp Downtown area, Chula Vista, San Marcos, Oceanside, and Point Loma. Pipes Cafe is a surfer breakfast place that is always crowded. There are locations in San Clemente and Cardiff. Some of my kids still prefer IHOP. There are locations throughout the county. Pizza Nova is a favorite date-night place. We’ve never taken the kids, so I can’t speak to the kids’ fare. Read my review here. Locations are in Point Loma, Solana Beach, and San Marcos. Dominick’s at the Harbor is a place we discovered via a Groupon deal. It’s turned out to be a favorite place for pizza, reminiscent of my very favorite ChiChi’s, the gold standard of pizza. We’ve also enjoyed Shakeys, a blast from my past. There are locations in Chula Vista, La Mesa, and Oceanside. Next on my list of places to try, though, is Pizza Port. Saw it on TV, and it looks yummy! Most often, though, if I don’t make pizza at home, we pick up a couple from Costco’s food court. Mediterranean is one of my favorite food profiles, so I’m always happy to find a great place for a gyro. 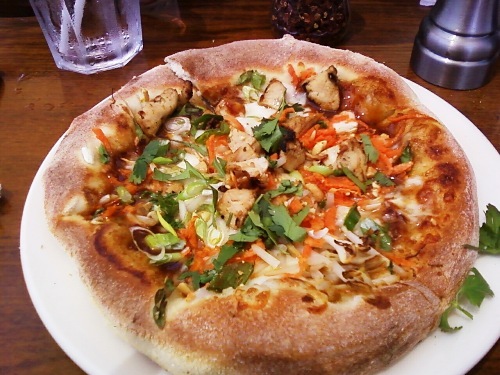 Luna Grill is a great place with locations in Carmel Valley, Carlsbad, Mission Valley, and Hillcrest. 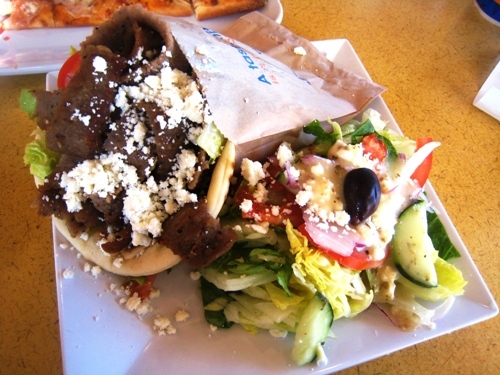 Downtown in Seaport Village, Greek Islands Cafe is really yummy, right on the waterfront. Be sure to get a table outside. There is no shortage of good Mexican in San Diego county. We are so close to the border! El Indio, famed home of the taquito, is a great tasting place offering quality food. Outdoor seating is available out front, a nice touch for families. Independently owned Mexican restaurants are ubiquitous in San Diego. One of our favorite fish taco meals was at a little house in La Jolla that had been transformed into a restaurant. Alas, I don’t know the name of it, so I can’t tell you where to go! If in doubt, I always stand by Chipotle for healthy fare, generous portions, and reasonable pricing. There are some great burger places in these here parts. So many that I can’t list them all. 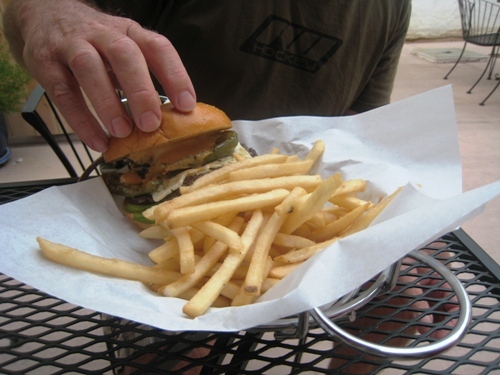 The Counter offers you the opportunity to build your own burger from a vast array of topping choices. Locations are in Del Mar and Carlsbad. Elevation Burger presents a menu of grass-fed beef burgers and, again, a variety of toppings. Locations are in Carlsbad and San Diego. In-N-Out is a western US chain that offers great burgers made from their own ground chucks. No pink slime there. I asked. San Diego is gaining a reputation for excellent micro-breweries. If you have a chance to take a tour or dine in one of the local brewery’s restaurants, it will be worth it. These may be a little pricier, but general good. Karl Strauss is a favorite of ours. They have outgrown the micro-size, but still offer a vast menu of choices. Locations are Downtown, La Jolla, Sorrento Mesa, and Carlsbad. The Fox Sports Grill downtown is right on the water. I’ve only been there once for lunch, but I loved the Chicken Cobb Salad. And the outdoor seating is quite pleasant. Make it a delicious staycation! I love to cook. You know that. But, I’m also happy to let someone else do the cooking — or even buy a few convenience items to make meal prep easier. I call that fun food. Whatever you do, make your staycation tasty! This post is part of Year of the Staycation. Around the web today you’ll find staycation ideas for dozens of cities represented throughout the country. Check out my recommendations for things to do in San Diego. Tomorrow, I’ll be sharing the links to all of them. You’re sure to find great things to do in a city near you. Don’t forget Bronx Pizza (in Hillcrest? somewhat near the zoo, at least to those of us coming from north SD county)… and El Nopalito for mexican, with both a restaurant and a grocery store, right off the 5 at Santa Fe Drive in south Encinitas! Can’t wait to try a few new (to us) places out! When I lived in Oceanside, The Armenian Cafe (http://m.thearmeniancafe.com/#!Pitas|restaurant_2) in Carlsbad was my favorite for Mediterranean. I have not been since I moved away in 2004, but they are still in business so I assume they are still good. Enjoy lunch out on the patio! We usually ate pizza at Killer Pizza from Mars (http://www.killerpizzafrommars.com/). Kids of all ages will love the themed decorations too. And Ocean Thai Cuisine regularly delivered to our home from their Mission Ave. location. Same disclaimer. It’s been 9 years since I moved to Arkansas, so check recent online reviews to see if the food sounds like it is still enjoyable. I heart Daphne’s. : ) Thanks for this list. I’m in LA County but I’m sure that I’ll be in the San Diego area sometime this summer. LOVE Pipes! We used to camp across the street at Cardiff every July with family and almost every morning we’d walk across the street to split a breakfast burrito and enjoy a Mexican coffee. Everything looks so yummy! We are always remarking on how little we see of Nashville, living so close and all. Can’t wait for our family of 5 to take a “Stay-cation”. Thanks for the great post! When I lived in San Diego some of my favorites were Rubio’s Fish Tacos (there are several around), Pick Up Stix for fast, fresh Chinese (we went to the one in Chula Vista but there are lots of locations),and for a wonderfu lsoup and salad buffet we loved Soup Plantation (similar to Sweet Tomato’s in Florida). I loved seeing your list–it brought back so many good memories from 13 years in San Diego! Whenever I visit which is never enough I always have to go back to my favorites! What about Naked Cafe? Love their specials!!! When we lived in N. County we always took our guests to Las Olas, Naked Cafe and Milton’s. Great, now I’m homesick. @Kristine, never heard of any of those places. Will have to try them out. Thanks!